Instagram is emerging as a very strong marketing platform. This also means that it can be used to market your blog and drive traffic to it. 300 million people are actively using Instagram, and they’re spending more time on it than ever before. According to Kevin Systrom, Co-founder of Instagram, globally, the average Instagram user spends 21 minutes on the app per day. Instagram was once almost exclusively devoted to photography, but as the platform has evolved, so has the content sharing – leading to a more diversified content posting, including memes, infographics, video, and promotions. If you have a strong Instagram strategy and post great content regularly, you can quickly build a strong following, market your website and ultimately generate tons of traffic to it. In this article, we’ll teach you How to Effectively Market Your Blog on Instagram. Your bio is the only place where you can have a clickable link on Instagram. To avoid spam, Instagram decided not to make it possible to share clickable links in comments or captions. Therefore, taking advantage of the only free place where you can add a link that is clickable is key for generating website traffic. By making your Instagram account to a so-called “Business account“, you also get access to “Instagram insights” where you can see statistics on how many people have clicked the link in your bio. Considering you can’t add website links in your post captions, you must have different approaches to directing your followers to your website. That is exactly what calls to action does. The most common call to action on Instagram people use when they want their followers to visit their website is “link in bio” or click the website link in our bio”. This lets people know they can access whatever you are marketing on your post by simply clicking the link in your instagram bio. 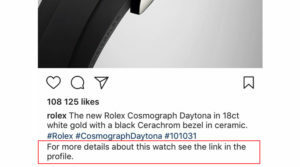 Rolex has implemented this tactic in their Instagram strategy to drive traffic to their website and to give further information if people click the website link. Instagram videos are a great way to share a living story that appeals to your audience. In fact, if you’re looking to do videos, you have the statistics on your side, because videos on Instagram generate three times more inbound links than an image, so making a video and adding your website link on it can really help you drive traffic to your website. To empower the message of the video, you could also mention your website in the video. A website link in only on bio (your) only reaches your own followers. But if you would like to get a bigger reach and market your blog to a completely new audience, influencer marketing is extremely powerful. Find influencers in your niche and ask them to share a post, telling them about your website. Because influencers are trusted individuals and have a lot of credibility in their industry, their message often speaks a lot louder than brands’. In fact, Consumers are 92% more likely to trust their peers over advertising when it comes to purchasing decisions, and performing actions, in this case clicking your website link. 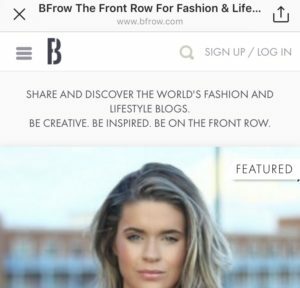 A lot of brands are setting up affiliate programs for influencers and in this way get a ton of Instagram bio links to their website and mentions in the influencers’ posts. Daniel Wellington is a brand who has built almost its entire brand based on Instagram influencer marketing, getting tons of traffic from their influencers. 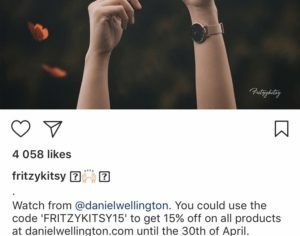 Here’s a Daniel Wellington ad made by the influencer @fritzykitsy, adding the official Daniel Wellington caption in the description. 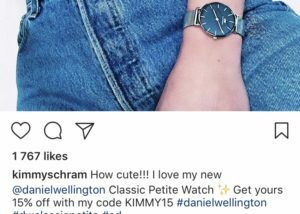 Here’s another marketing post for Daniel Wellington by @kimmyschram, adding the call to action that people can get the watch with 15% off. Instagram ads are currently the only way you can get a website link on your post, and this can result in a huge amount of traffic – if your ads are appealing. You can target your audience based on a ton of criteria such as age and demographics in order to get the highest ROI possible. By implementing Instagram ads on top of your normal Instagram posts and efforts, you’ll surely see an increase in your website traffic – and in the long run an increased awareness of your blog. The increased website/blog awareness will ultimately also lead to even more traffic, shares and mentions etc. By using Instagram ads, you can reach a bigger audience, while also being able to track the results of your campaigns to see how they performed. The brand gets a “Learn more” button at the bottom of their post, which is a link to the brand’s website. 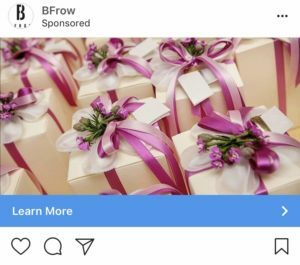 This post link is only attainable if you’re using Instagram ads, and I can ensure you that the brand BFrow, which has created this ad campaign will see an increase in website traffic with the help of this ad – as a result of the link on the post. As Instagram enters the world of paid advertising and does it with the year-long experience of Facebook, Instagram is believed to outperform Twitter and Google in ad sales in a very short period of time. If you want to build awareness of your blog/website, while at the same time generating loads of traffic and leads, Instagram ads is the way to go. If you have a limited budget, going all organic also works, but it demands hard work and a strong strategy of growth to reach new audiences and ultimately get more website visitors.